Looks like we are having to suffer a sudden charm offensive from Arsenal’s second largest shareholders, Messrs Red and White. Mr Usmanov, or ‘Red’ as I call him, has been talking to CNBC, while Farhad Moshiri has spoken to Reuters. “It’s time Arsenal won trophies like the Champions League,” says Mr U. Well I think we can all agree on that. “He is a great player, there would be great success for Rooney [if he joined Arsenal], and for Arsenal too.” Bit presumptuous. It’s only Rooney, not Messi. Usmanov has also “backed a summer transfer spree in an attempt to revive the club’s fortunes”. I think most of us are on board with that one too – I’m starting to think he might just be saying what we want to hear. Well that’s something to look forward to then. In December he also said: “I want to talk with every Arsenal fan. I am with you. I’m one of you. I’m ready to help the club with anything that I can.” Obviously that’s anything apart from helping Fanshare or making any legally binding promises about taking money out of the club or ticket prices or fans’ rights . . . or pretty much anything really. Still, he likes Arsène, so that’s nice. Meanwhile this week Moshiri has popped up to have a word with Reuters. He apparently said “Arsenal would start to benefit from a £30m deal with Puma, echoing media reports that the German sportswear company was set to replace Nike as the club’s kit supplier.” Some fans took this as proof that the Puma deal was on, even though the club has not yet commented. Let me tell you something: Moshiri doesn’t know any more about the Puma deal than the rest of us. He’s not on the inside. However, it’s perceptive of him to spot that £30m a year will be a benefit. Not this year, though. He also said: “Arsène Wenger was the reason we invested and he is very much the reason why we continue to support the club.” Okay – so what are R&W going to do when Arsène leaves then? It might be next year, it might be in three years or even five, but he will leave. If he’s the only reason you’re interested then that seems a shortsighted view. Moshiri then turned pundit to say that “Wenger’s longevity would be an advantage when champions Manchester United and rivals Manchester City and Chelsea are all under new management.” Really. Well that may be true, but he seems to be overlooking that Chelsea have gone back to an old manager, and in any case they’ve still been winning trophies even when they change manager every five minutes. And Man City have so much money they even won the league with a very average manager who couldn’t control the players. But still . . .
“He [Wenger] remains the one with deep experience in the top four, and that provides a significant edge for the club. They managed to stay in the top four with very strict finances and without some of the biggest players. Now they have the foundation to move on,” said Moshiri. He’s starting to sound like a spokesman for the Board. “Ivan Gazidis has secured a major win in the contract with Puma, for £30m a year,” he added. “That is a significant win for Arsenal. That shows Puma’s confidence in London and, through London, Arsenal.” Now he sounds like the Ivan fan club. Suddenly R&W love everyone! Oh, hold on: “Should they invite us, or consult us, we are there to help.” Ah, I see. It’s all about helping now. Not about taking over at all. Not about waking up one morning and finding Arsenal belongs to you. What a guy. I don’t believe much that either of the principals of Red & White have to say on the subject of Arsenal. They’re in it for themselves, not for us. When they stop saying “We’re like the fans, and all the fans are important to us” and start doing things that would help fans, then I’d be a little less suspicious and cynical. 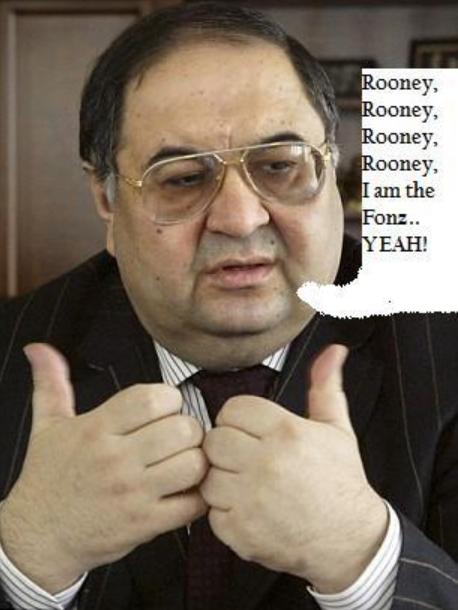 Amazingly some saw Usmanov’s quotes about Rooney as a chance to make up quotes from him. When challenged they went rather quiet. In other Usmanov news, it was the fortnightly update on Arsenal.com today on the share position. R&W still apparently stuck one share short of 30%. I’ve heard – and don’t quote me, this is just between us – that Arsenal take their time with the paperwork for R&W’s shares just to annoy them. Still, they’ve been on 18665 for at least six weeks now, and no one could be that inefficient with paperwork, could they. Especially not a company that’s managed a £30m a year deal with Puma. Finally a picture tweeted to me earlier by @ArseneWonga. If this doesn’t prove we’re signing Rooney, I don’t know what will. Hang on, the Fonz used to say ‘Heeeeeeyyyyyyyyy!’ didn’t he, not ‘Yeah!’? The Rooney deal is off. You are my favorite Arsenal site, yet this is the worst article I have seen on the site. Seemed malicious. I’m not used to this type of article from you. Who wrote it? You are not my favorite Arsenal site, yet this is the best article I have seen on the site. Seemed malicious. I am not used to this type of article from you. You are soo one sided (ivan gazidis side ) I guess. Usmanov as got a good eye for the club, so just pls stop mis-informing fans about the R&W company. Terrible article mate. Your feelings on this sibject are obvious. It’s so disgusting when pple try to condemn Usmanov. Is Arsenal not under the control of Kronke? What is he doing? He doesn’t even love the club. So what’s wrong if Usmanov would want to take over the club in the future? Is Kronke better? Arsenal needs an Abramovic to be able to talk when “big boys” are talking. I don’t like Kronke in any bit. He’s a failure. Phil, could it be that Stan and Alisher have done a deal? How else to account for the conciliatory tone towards the current regime from the big guns of Red & White. Words of praise for the way the Club is going? Unheard of before. Congratulations to the Great Gatz for the upcoming Puma deal? Not at all the way of mortal enemies. I suppose the beasts from the East could be readying themselves to stick the knife in should the promised big summer spend not occur. More likely, though, the Yank is bringing the Uxbek on board. In which case we might have a Noah’s Ark-ful of super signings. Exciting times! I think if they’ve done a deal, it’s for the whole club. Can’t see them ever on the same Board together. But this is a definite change of tone for *some* reason. Any chance you could do a blog on the difference in custodianship pre-Kroenke and post-Kroenke? I’d like to know what everyone is moaning about and I’m pretty sure you’re the man to get to the bottom of it. That would be a very subjective piece, Andy. Who is to say when the idea of custodianship changed or disappeared? Was David Dein a ‘custodian’? Was PHW, up to the point he sold shares to Dein, or perhaps up to the point he sold his last shares to Kroenke? Was Lady Nina, just because her husband’s family had been involved for generations even though she hadn’t? 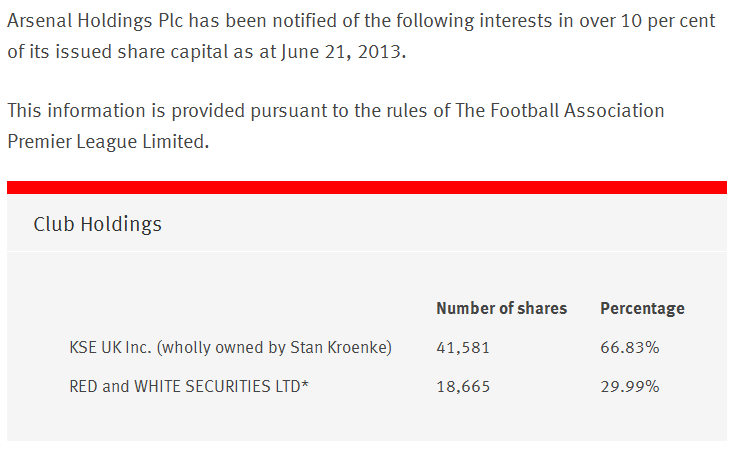 Is Stan more of a custodian than PHW because he’s never sold a share in a sports club and PHW has? I don’t think I can resolve any of that. By the time Dein came in to Arsenal in the 1980s, custodianship was probably done, as Dein was really financial investor. Dein first partly cashed out to Fisman early on (when Dein was in a spot of trouble), then Dein tried to bring in Kronke and cash out to him, then Dein finally did cash out to Usmanov. Dein’s desire to exit the club with a lot of cash was very clear, very consistent and markedly different from the character of previous club leadership/ownership. Dein took a big salary for himself, stuck his own son’s hand in the till, and then cashed out his shares. This is not custodianship. Hot air discharge by a windbag. He had nothing to say, really. The press need to find something useful to write about instead of covering every utterance of his. As time goes on, everything coming out of the Red and White camp sounds more and more like an opposition party in politics. That in itself is not a problem, as their goal is exactly the same, to disrupt the current leadership and replace them. It just means that you treat what they say with the same weight as you would anything that an opposition minister says. As the article shows, while things are going well their best option is to associate themselves as strongly as possible with all of the good things. (How do they come over if they criticize the biggest kit deal in football). It still leaves them free to attack policies they don’t like, or if it will improve their popularity. The Rooney stuff is another example of their no-lose mischief making. If by some chance we sign him (a bad Idea from my viewpoint), they get the PR boost from it being their idea. If we don’t, they get another stick to beat the board with the first time things go wrong (If we’d signed Rooney…….). It is just the way it is right now I guess. Kronke has no real incentive to sell, or even offer any concessions. That means Red and White either sell up, or play the long game, and they appear to be doing the latter. In your analogy, I take it that we, the fans, are the voters. So in what way do the ‘opposition’ hope that we vote – with our feet , by staying away? On your final point, how can you be sure that Mr K has no incentive to offer a concession to Mr U? Like commercial deals in return for a seat on BoD? And that seat is no danger to him, is it? – not while Mr K has a majority holding. Usmanov has been and remains a rival for control of the club. And has been actively working to destabilize the current board and cash in on his stake. Usmanov isnt looking to join the board for reason of prestige or pride. He wants inside information Board participation means access to inside information about the clubs strategy, specific plans and financial prospects. This is why Dein was turfed from the board once he started taking action that was counter to what they had agreed on: they could no longer trust him with access inside information. Meanwhile you make it sound like “oh its just afternoon tea and BTW why cant they let poor Genghis join in the fun, he’s so lonely”. No he isnt – he is a minority shareholder who wants to cash in. Obviously he wants inside information as to what is the maximum possible value he can demand in order to move on. Spare is this nonsense please. Letting Usmanov in on the board is like you planting a bug in your bedroom and then offering free access to that slimy guy in your girlfriends office who has been trying to get in her pants: it would be beyond stupid. englandsbest — actually no in terms of the fans, or at least I think. To be honest, I really don’t see how he is going to benefit, but the guy clearly believes that he can generate enough pressure on the board and owners to get a spot on the board, and from there…. As to the last point, I was trying to put an argument together, and then read Ziontrain’s post. While not how I’d express it, it sums up the issue. Kroenke does not sell his clubs. Usmanov still wants Arsenal. Until that conflict is resolved, there is no incentive at all to open up the club’s inner workings to Mr U. Where do you get all this inside dope – is it telepathy or do you use a crystal ball?